The next two chapters are just as useful for people wishing to install a solar hot water system as they are for people wishing to install solar electricity. Whenever I refer to solar panel or solar array (multiple solar electric panels) in these two chapters, the information is equally valid for solar electricity and solar hot water. Solar energy is a combination of the hours of sunlight you get at your site and the strength of that sunlight. This varies depending on the time of year and where you live. This combination of hours and strength of sunlight is called solar insolation or solar irradiance, and the results can be expressed as watts per square metre (W/m²) or, more usefully, in kilowatt-hours per square metre spread over the period of a day (kWh/m²/day). One square metre is equal to 9.9 square feet. Photovoltaic solar panels quote the expected number of watts of power they can generate, based on a solar irradiance of 1,000 watts per square metre. This figure is often shown as a watts-peak (Wp) figure and shows how much power the solar panel can produce in ideal conditions. A solar irradiance of 1,000 watts per square metre is what you could expect to receive at solar noon in the middle of summer at the equator. It is not an average reading that you could expect to achieve on a daily basis. However, once you know the solar irradiance for your area, quoted as a daily average (i.e. the number of kilowatt-hours per square metre per day), you can multiply this figure by the wattage of the solar panel to give you an idea of the daily amount of energy you can expect your solar panels to provide. Solar irradiance varies significantly from one place to another and changes throughout the year. In order to come up with some reasonable estimates, you need irradiance figures for each month of the year for your specific location. Thanks to NASA, calculating your own solar irradiance is simple. NASA’s network of weather satellites has been monitoring the solar irradiance across the surface of the earth for many decades. Their figures have taken into account the upper atmospheric conditions, average cloud cover and surface temperature, and are based on sample readings every three hours for the past quarter of a decade. They cover the entire globe. For reference, I have compiled this information for different regions across the United States, Canada, Australia, New Zealand, the United Kingdom and Ireland in Appendix B. The website goes further. We have incorporated solar irradiance charts for every major town and city in every country in the world: simply select your location from a pull-down list of countries and cities and you can view the irradiance figures for your exact area. These figures show how many hours of equivalent midday sun we get over the period of an average day of each month. In the chart above, you can see that in December we get the equivalent of 0.6 of an hour of midday sun (36 minutes), whilst in June we get the equivalent of 4.86 hours of midday sunlight (4 hours and 50 minutes). The tilt of a solar panel has an impact on how much sunlight you capture: mount the solar panel flat against a wall or flat on the ground and you will capture less sunlight throughout the day than if you tilt the solar panels to face the sun. The figures above show the solar irradiance in London, based on the amount of sunlight shining on a single square metre of the ground. If you mount your solar panel at an angle, tilted towards the sun, you can capture more sunlight and therefore generate more power. This is especially true in the winter months, when the sun is low in the sky. 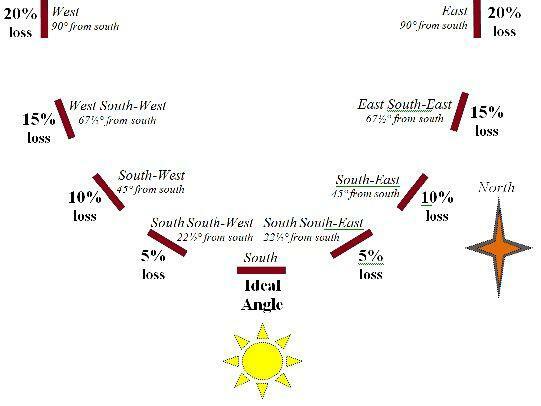 This diagram shows the different intensity of light depending on the angle of sun in the sky. When the sun is directly overhead, a 1m-wide shaft of sunlight will cover a 1m-wide area on the ground. When the sun is low in the sky – in this example, I am using an angle of 30° towards the sun – a 1m-wide shaft of sunlight will cover a 2m-wide area on the ground. This means the intensity of the sunlight is half as much when the sun is at an angle of 30° compared to the intensity of the sunlight when the sun is directly overhead. If we tilt our solar panels towards the sun, it means we can capture more of the sun’s energy to convert into electricity. Often the angle of this tilt is determined for you by the angle of an existing roof. However, for every location there are optimal angles at which to mount your solar array, in order to capture as much solar energy as possible. Note: All angles are given in degrees from vertical and are location specific. Look at the difference in the performance based on the tilt of the solar panel. In particular, look at the difference in performance in the depths of winter and in the height of summer. It is easy to see that some angles provide better performance in winter; others provide better performance in summer, whilst others provide a good compromise all-year-round solution. Because of the 23½° tilt of the earth relative to the sun, the optimum tilt of your solar panels will vary throughout the year, depending on the season. In some installations, it is feasible to adjust the tilt of the solar panels each month, whilst in others it is necessary to have the array fixed in position. This angle is the optimum tilt for fixed solar panels for all-year-round power generation. This does not mean that you will get the maximum power output every single month: it means that across the whole year, this tilt will give you the best compromise, generating electricity all the year round. Depending on when you want to use your solar energy, you may choose to use a different tilt in order to improve power output at a given point in the year. Each month of the year, the angle of the sun in the sky changes by 7.8° – higher in the summer and lower in the winter. By adjusting the tilt of your solar panel to track the sun, you can tweak the performance of your system according to your requirements. You can see this monthly optimum angle (rounded to the nearest whole degree) on the bottom row of the previous table. Here is an example of how you could tweak your system. Performance of a solar system is at its worst during the winter months. However, by tilting your panels to capture as much of the sunlight as possible during the winter, you can significantly boost the amount of power you generate at this time. As you can see from the previous table, if you tilt your solar panels at this angle, you will sacrifice some of your power generation capability during the summer months. However, as you are generating so much more power during the summer than you are in the winter, this may not be an issue. More importantly, compared to leaving the panels on a flat surface, you are almost doubling the amount of power you can generate during the three bleakest months of the year. This means you can reduce the number of solar panels you need to install. If you wish to get the best output of your system overall, you will find that you will get slightly more energy, when measured over the course of the whole year, by angling your solar panels to an optimum summer time tilt. In warm climates, where maximum energy consumption is during hot weather, angling your panels to get the maximum amount of sunlight during the height of summer can be the best solution, both financially and environmentally. Regardless of where you live, the sun always rises from the east and sets in the west. If you live in the Northern Hemisphere, solar panels will always work best if they are south-facing. In the Southern Hemisphere, solar panels work best if they are north-facing. However, it is not always possible to position your solar panels so they are facing exactly the right way. For instance, if you want to install solar panels on the roof of the house, and the roof faces east/west, then it may not be practical to install solar panels in any other location. Thanks to improved solar panel design over the past decade, this is not as big a problem as was once the case. Whilst the figure varies slightly in different parts of the world, from one solar panel manufacturer to another and during the different seasons of the year, the average efficiency drop of a solar panel mounted away from due south (due north in the Southern Hemisphere) is around 1.1% for every five degrees. This means that if your panels face due east or due west, you can expect around 20% loss of efficiency compared to facing your panels in the optimum position. You can even face your panels in the completely opposite direction – north in the Northern Hemisphere or south in the Southern Hemisphere – losing around 40% of the efficiency of your solar array by doing so. For the Northern Hemisphere, this chart shows the approximate efficiency loss by not facing your panels directly south. For Southern Hemisphere countries, the chart should be reversed. As you can see, there is a big difference in the amount of energy you can generate in the middle of summer, compared to winter. In the example above, over eight times the amount of energy is generated in the height of summer compared to the depths of winter. In the same way that you can work out how much energy a solar panel will generate per day, you can use solar irradiance to give you an approximate guide for the required capacity of solar array that you need. I cover all this in the next chapter when I look at the site survey. Nevertheless, it can be useful to carry out this calculation in order to establish a ballpark cost for your solar electric system. The calculation is simple: take the figure you calculated for your total number of watt-hours per day and divide it by the solar irradiance figure for the worst month that you require your system to work. If we have our solar panels laid flat, we would need a 1,159-watt solar array to power our home in December. If we mount the solar panels vertically against a wall, we could generate the same amount of power with a 688-watt solar array. Angled towards the equator, we could generate the same amount of power with a 661-watt solar array. With the optimum winter tilt, we can use a 643-watt solar array. With the tilt of the solar panel adjusted each month, we can use a 643-watt solar array, the same as the best winter tilt settings. This chart tells us that to provide full power for our holiday home in December, we require a solar array with a generation capacity of between 643 watts and 1159 watts, depending on the tilt of the solar panels. But remember our scope. We only want to use the home full time from March to October. The solar electric system only needs to provide enough electricity for a long weekend during the winter. This means that, so long as our batteries are big enough to provide electrical power for a few days, it does not matter if the solar power in winter is not enough to provide for constant use. As soon as we close up the holiday home again, the solar panels will recharge the batteries. If we have our solar panels laid flat, we would need a 411-watt solar array to power our home in October. If we mount the solar panels vertically against a wall, we could generate the same amount of power with a 335-watt solar array. Angled towards the equator, we could generate the same amount of power with a 288-watt solar array. With the optimum winter tilt, we can use a 293-watt solar array. With the tilt of the solar panel adjusted each month, we can use a 288-watt solar array, the same as the best year-round tilt settings. This chart tells us that we require a solar array with a generation capacity of between 288 watts and 411 watts, depending on the tilt of the solar panels. Compared to our earlier calculations for generating power throughout the year, it is much lower. We have just saved ourselves a significant amount of money. You can also see that during the summer months, the solar electric system will generate considerably more electricity than we will need to run our holiday home. That is fine. Too much is better than not enough and it allows for the occasions when a light is left switched on or a TV is left on standby. The biggest negative impact on solar energy production is shade. Even if only a very small amount of your solar array is in shade, the impact on the performance of your whole system can have a very big effect. Unlike solar thermal (hot water) systems, the loss of power through shading is much greater than the amount of the panel that is in shade. With solar thermal systems, if 5% of the panel is in shade, you lose around 5% of the power production. Depending on the exact circumstances, even if only 5% of a photovoltaic solar panel is in shade, it is possible to lose 50–80% of power production from your entire solar array. For this reason, it is hugely important that your solar energy system remains out of shade throughout the day. Sometimes this is not possible, and this requires some additional design work in order to keep the effect of shade on your system to a minimum. I cover shade in much more detail in Appendix A, including an explanation of why shade has such a big impact on energy production. For now, it is just important to know that shading can significantly affect the amount of energy you can get from your solar energy system. Now we know the theoretical size of our solar panels. However, we have not taken into account the efficiencies of the panels themselves or the efficiencies of the controller or inverter that handles them. Solar panels are rated on their ‘peak power output’. Peak power on a solar panel in bright sunlight is normally generated at between 14 and 20 volts. This voltage can go up and down quite significantly, depending on the amount of sunlight available. This swing in voltage gets much higher if you have multiple solar panels connected together in series – or if you are using a higher-voltage solar panel. It is common for a solar array with fifteen or twenty panels connected in series to have voltage swings of several hundred volts when a cloud obscures the sun for a few seconds! Managing this voltage swing can be done in one of two ways. The cheap and simple method is to cut the voltage down to a setting that the solar panel can easily maintain. For instance, a solar panel rated at 12 volts will usually maintain a voltage level of at least 14 volts during daylight hours. A charge controller or inverter that cuts the voltage down to this level will then always be able to use this power. The disadvantage of this approach is that, as you cut the voltage, the wattage drops with it, meaning you can lose a significant amount of energy. In terms of the amount of energy you can capture, as opposed to what the solar array collects, this method can reduce the efficiency of a solar array by around 25%. A better solution is to use controllers and inverters that incorporate Maximum Power Point Tracking (MPPT). Maximum power point tracking adjusts the voltage from the solar array to provide the correct voltage for the batteries or for the inverter in order to remove this inefficiency. Maximum power point trackers are typically 90–95% efficient. Over the past three years, the price of MPPT controllers and inverters has dropped and the availability has increased to the point where it is almost always worth buying an MPPT controller and inverter for all but the very smallest and simplest solar installations. Incidentally, you only need an MPPT inverter for grid-tie systems where you are powering the inverter directly from the solar panels. You do not require an MPPT inverter if you are planning to run the inverter through a battery bank. Solar panels will generate less power when exposed to high temperatures compared to when they are in a cooler climate. Solar PV systems can often generate more electricity on a day with a cool wind and a hazy sun than when the sun is blazing and the temperature is high. When solar panels are given a wattage rating, they are tested at 25°C (77°F) against a 1,000 W/m² light source. At a cooler temperature, the solar panel will generate more electricity, whilst at a warmer temperature the same solar panel will generate less. As solar panels are exposed to the sun, they heat up, mainly due to the infrared radiation they are absorbing. As solar panels are dark, they can heat up quite considerably. In a hot climate, a solar panel can quite easily heat up to 80–90°C (160–175°F). Solar panel manufacturers provide information to show the effects of temperature on their panels. Called a temperature coefficient of power rating, it is shown as a percentage of total power reduction per 1°C increase in temperature. Typically, this figure will be in the region of 0.5%, which means that for every 1°C increase in temperature, you will lose 0.5% efficiency from your solar array, whilst for every 1°C decrease in temperature you will improve the efficiency of your solar array by 0.5%. In northern Europe and Canada, high temperature is not a significant factor when designing a solar system. However, in southern states of America and in Africa, India, Australia and the Middle East, where temperatures are significantly above 25°C (77°F) for much of the year, the temperature of the solar panels may be an important factor when planning your system. If you are designing a system for all-year-round use, then in all fairness a slight dip in performance at the height of summer is probably not an issue for you. If that is the case, you do not need to consider temperature within the design of your system and you can skip this information. If your ambient temperature is high during the times of year you need to get maximum performance from your solar panels, then you will need to account for temperature in your design. You can help reduce the temperature of your solar panels by ensuring a free flow of air both above and below the panels. If you are planning to mount your solar panels on a roof, make sure there is a gap of around 7–10cm (3–4") below the panels, to allow a flow of air around them. Alternatively, you can consider mounting the panels on a pole, which will also aid cooling. For a roof-top installation, if the average air temperature at a particular time of year is 25°C/77°F or above, multiply this temperature in Celsius by 1.4 in order to get a likely solar panel temperature. For a pole-mounted installation, multiply your air temperature by 1.2 in order to calculate the likely solar panel temperature. Then increase your wattage requirements by the percentage loss shown in the temperature coefficient of power rating shown on your solar panels, in order to work out the wattage you need your solar panels to generate. By way of an example, here is a table for Austin in Texas. This shows average air temperatures for each month of the year, the estimated solar panel temperature for the hottest months of the year and the impact on the performance on the solar array, assuming a temperature coefficient of power rating of 0.5%. For around five months of the year, the ambient temperature in Austin is greater than 25°C/77°F. During these months, the higher temperature will mean lower power output from a solar array. If you are designing a system that must operate at maximum efficiency during the height of summer, you will need to increase the size of your solar array by the percentages shown, in order to handle this performance decrease. You can find the average ambient air temperature for your location by visiting The Weather Channel website at www.weather.com. This excellent site provides average monthly temperatures for towns and cities across the world, shown in your choice of Fahrenheit or Celsius. Our example holiday home project is in the United Kingdom, where the temperature is below 25°C for most of the year. In addition, our solar design will produce more power than we need during the summer months. As a result, we can ignore temperature in our particular project. It is worth stressing again that these figures are only approximate at this stage. We have not yet taken into account the site itself and we are assuming that shading will not be an issue. If you are planning to do the physical installation yourself, a solar electric system consisting of solar array, controller and battery costs around £4.00 ($6.20 US) per watt, +/– 15%. A grid-tie system is cheaper to install than a stand-alone system, as you do not need to budget for batteries. You will, however, need a qualified electrician to certify the system before use. In most countries, you will also need all the components used in your solar installation to be certified as suitable for grid installation. If you are planning grid-tie, budget around £2.00–£3.00 ($3.10–$4.60 US) per watt, +/– 15%. For our holiday home installation, we need 320 watts of solar electricity if we tilt the solar panels towards the sun, or 456 watts if we mount the panels flat. Our rough estimate suggests a total system cost of around £1,280 ($1,970 US), +/– 15% for tilted panels, or £1,824 ($2,800 US) +/– 15% for a flat panel installation. If you remember, the cost to connect this holiday home to a conventional electricity supply was £4,500 ($7,200). Therefore, installing solar energy is the cheaper option for providing electricity for our home. What if the figures do not add up? In some installations, you will get to this stage and find out that a solar electric system simply is unaffordable. This is not uncommon. I was asked to calculate the viability for using 100% solar energy at an industrial unit once, and came up with a ballpark figure of £33½m (around $54m)! When this happens, you can do one of two things: walk away, or go back to your original scope and see what can be changed. The best thing to do is go back to the original power analysis and see what savings you can make. Look at the efficiencies of the equipment you are using and see if you can make savings by using lower-energy equipment or changing the way equipment is used. If you are absolutely determined to implement a solar electric system, there is usually a way to do it. However, you may need to be ruthless as to what you have to leave out. In the example of the industrial unit, the underlying requirement was to provide emergency lighting and power for a cluster of computer servers if there was a power cut. The cost for implementing this system was around £32,500 ($52,000): comparable in cost to installing and maintaining on-site emergency generators and UPS equipment. Now we know the capacity of the solar panels, we can work out an approximate size of our solar array. This is extremely useful information to know before we carry out our site survey: the solar panels have to go somewhere. We need to be able to find enough suitable space for them where they will receive uninterrupted sunshine in a safe location. There are two main technologies of solar panels on the market: amorphous and crystalline solar panels. I will explain the characteristics and the advantages and disadvantages of each, later on. For the purposes of working out how much space you’re going to need to fit the solar panels, you need to know that a 1m² (approximately 9.9 square feet) amorphous solar panel generates in the region of 60 watts, whilst a 1m² crystalline solar panel generates in the region of 160 watts. Therefore, for our holiday home, we are looking for a location where we can fit between 5 and 7.6m² (49–75 square feet) of amorphous solar panels or 2–3m² (20–29 square feet) of crystalline solar panels.